I felt it appropriate to unveil the first of my new labels in the post for this beer. I have created somewhat of a template which I hope to incorporate into future labels. I have been doing some thinking about the best way to share my recipes/brewdays with everyone on the interwebs and decided it would be best to wait until I had the final product before me to do so. In these and future posts I will give a short descriptive synopsis of the beer, followed by the recipe and sum it up with my thoughts. The beer smells exactly like pumpkin pie, and not just the spices. Call me crazy, but as I take deep sniff, I can pick out a the smell of pie crust. The beer is a bronze-orange color, which at the time of tapping is a tad hazy (picture to come). 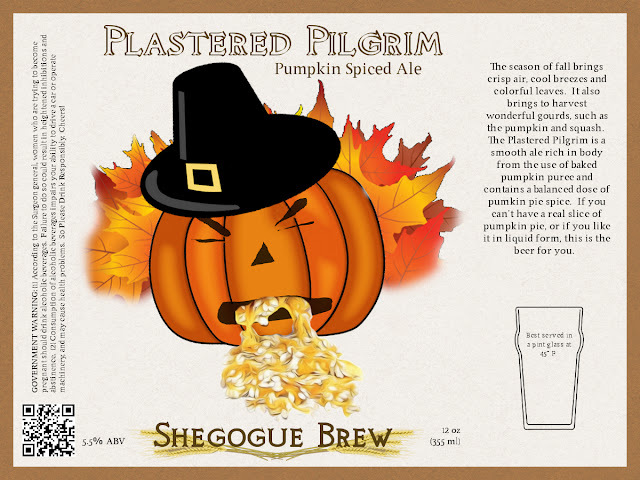 The pumpkin spices flood the mouth, followed by a moderate carbonation and creamy body. The spicing is balanced, and the beer leans a tad towards the malty side. The finish has a gentle tinge of alcohol warmth (most likely from the low level of bitterness). This is a very palatable pumpkin ale, and one that could be consumed in session quantities. The spicing does not overwhelm. Overall - This beer is pretty tasty. I can't take full credit for the recipe as I modeled it largely off of the hit "Thuderstruck Pumpkin Ale" on HBT. I think this may become a seasonal for me, but I will leave it up to friends and relatives to decide.